(14 PEOPLE HAVE ALREADY MADE THEIR DEPOSIT!). Velkommen To Trønderlag Of America Founded in September 1908, Trønderlag of America is an organization of emigrants and their descendants from North and South Trøndelag areas of Norway. Membership dues are $12/year for a U.S. member (less if you join for multiple years) AND a spouse/partner is included at no additional charge. ($12 for a 1-year membership, $22 for 2 years, $30 for 3 years) and only $13/year for our Canadian members and $15/year for our Norwegian members. We have an extensive library of genealogy/family research materials which can be accessed at our annual August meeting ("stevne") or by contacting our genealogist. 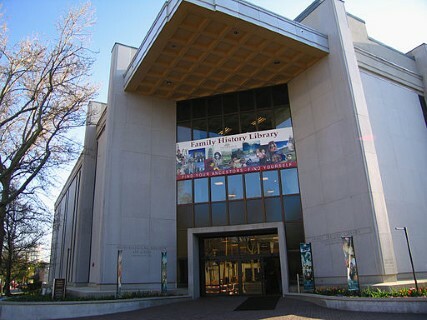 We are continually expanding this library, believed to be the largest collection of this type of material for North and South Trøndelag with the possible exception of the Family History Center in Salt Lake City and the Library of Congress. WE ARE A "BYGDELAG" (organization which focuses on a specific area of Norway). FOUNDED IN 1908, TRØNDERLAG OF AMERICA MEMBERS TRACE THEIR NORWEGIAN HERITAGE BACK TO NORTH AND SOUTH TRØNDELAG FYLKER (counties) IN NORWAY. WE CONTINUE TO REFER TO BOTH NORTH AND SOUTH TRØNDELAG FOR RESEARCH PURPOSES. With members scattered across three countries, our only regularly scheduled meeting is our annual "stevne" in August of each year. 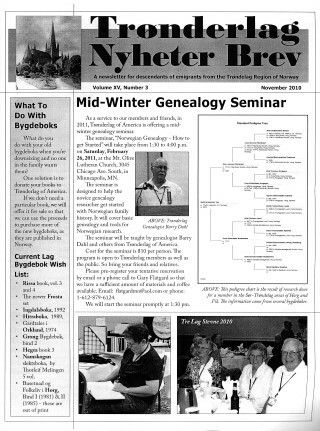 We mainly connect through our web site, our newsletter, our annual meeting, and research requests to our Genealogist. Those with detailed interest might want to read about our history. 1. Aid in the preservation of Norwegian history, culture and heritage for coming generations by collecting and preparing historical information and data relative to immigration and settlement and to encourage research and writing of family, immigration and settlement histories. 2. Maintain communication and working relationships between the members of Trønderlag and other related organizations with Norwegian Heritage. 3. Develop and maintain a library of resources, such as bygdeboker (farm histories), Norwegian church and government records and other such genealogical information. 4. Maintain and enhance fellowship among the descendants of people from the Trøndelag area of Norway and to maintain a bond between Trønders in North America and Norway. WHERE IS THE TRØNDELAG REGION OF NORWAY? Trøndelag is a county in the central part of Norway. It was created on 1 January 2018, with the merger of the former counties of Nord-Trøndelag and Sør-Trøndelag, which had been separated into two counties in 1804. Trøndelag county and the neighboring Møre og Romsdal county together form what is known as Central Norway. A person from Trøndelag is called a "Trønder". The largest city in Trøndelag is the city of Trondheim. The administrative center of the county is Steinkjer, although Trondheim is the seat of the county mayor. This is to make the county more efficient and not too centralized, as Trøndelag is the second largest county in Norway. 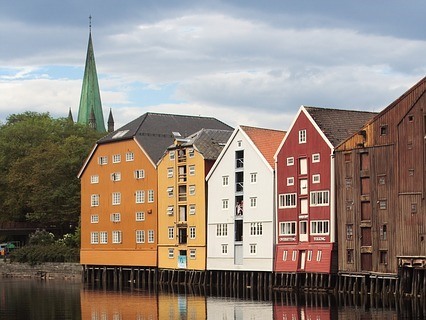 Trondheim, Norway’s medieval capital, and the country’s third largest city, has the Gothic-style Nidaros Cathedral dominating its skyline has traditionally been the sight of the coronation of Norway’s kings, and most recently their family weddings. WHAT'S THE DIFFERENCE BETWEEN "TRØNDELAG" AND "TRØNDERLAG"? Trøndelag (without an "R") is the name of a region of Norway. People from Trøndelag call themselves "Trønders". A lag is a club or organization. Trønderlag (with an "R") is then the name of an organization of Trønders. PUBLICATIONS: We publish our newsletter, "Trønderlag Nyheter Brev", 3-4 times each year as well as Årbøker (yearbooks) on a recurring basis. Årbøker include Trønderlag history and photos, emigration stories & letters, and often Trøndelag immigrant biographies. ANNUAL MEETINGS ("stevne"): Your chance to connect with others who love this part of Norway. Take part in genealogy labs with research assistance using the our resources (books, films, maps, family histories). Stevnes also feature seminars on cultural and historical Norwegian-American topics, a traditional banquet and many other enjoyable activities! GENEALOGY RESEARCH AND RESEARCH TRIPS TO NORWAY: Contact our Genealogist for assistance. Travel with us when we go to Norway. Approximately every 5 years we coordinate a trip to Norway where members, complete research at the regional archives in Trondheim, meet friends and relatives, and tour the area learning more about Norwegian culture and history. Canada Yearly membership $13 (U.S. funds). Lifetime memberships are $200 for all members. Dues include a spouse/partner at no additional charge, our newsletter, and research assistance. New members receive a welcome letter and all newsletters published so far that year. Members joining fairly late in a year are given the rest of the year free. 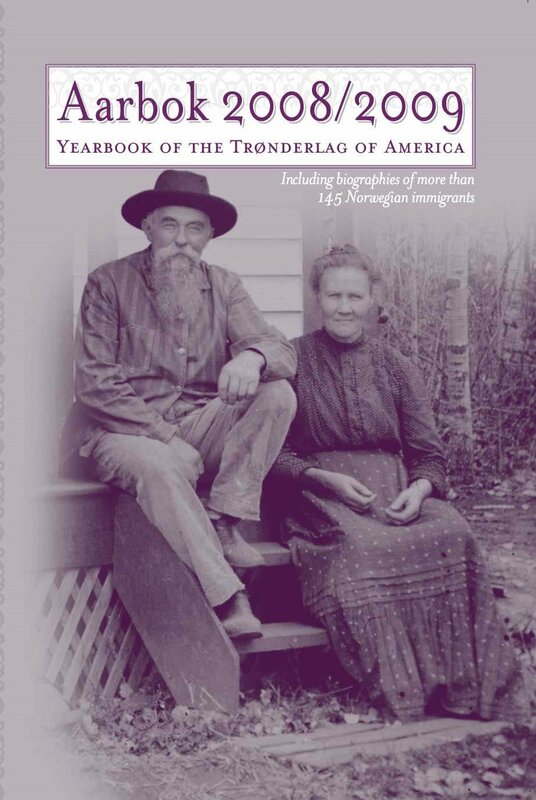 Membership in Trønderlag of American is open to anyone with an interest in the history and culture of the Trøndelag region of Norway, especially descendants of Trønder emigrants. We currently have approx. 350 member families in 36 states plus Canada and Norway. Memberships (except life memberships) expire on December, 31 of each year. See the Membership Application form for more details. . . Consider joining other bygdelags in addition to Trønderlag of America if your heritage spans more than one fylke. Bygdelagenes Fellesraad (the umbrella organization of all bygdelags) has contact information for all the lags. 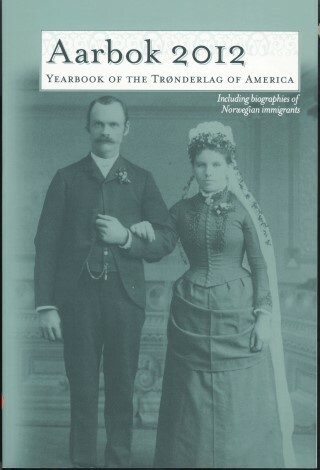 *Print a Trønderlag of America brochure (print double sided). : If you would like to pay your membership using a credit card, please follow the instructions on the membership form. Do not send us your credit card number. We will invoice you using Paypal. Some people complete the form, scan an image and attach it to an e-mail requesting a Paypal invoice. That way we have all the information we need to complete your membership record in our system. 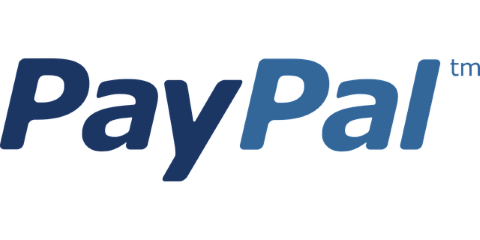 We are still working on a way to make the Paypal application easier to do on line, but for now, please use the methods above. BROCHURE:Our brochure also has membership application/renewal information. DONATION: We have a separate donation form (see the green donate button), and many members make a donation at the time they join or renew their membership. Your donation helps us expand our research materials. Trønderlag of America, is a not-for-profit organization under section 501(c)(3) of the IRS code. Donations are tax deductible to the maximum extent allowed by law. Trønderlag of America's collection of research materials, targeted at North and South Trøndelag, is believed to be the largest in the world (with the possible exception of the Family History Center in Salt Lake City or the Library of Congress), and is continually updated and expanded. If you are traveling to Trøndelag, please contact our Genealogist for a list of documents to buy and bring back. We will reimburse you for any document costs. GENEALOGIST: Our Genealogist will assist you with your e-mail and phone requests. 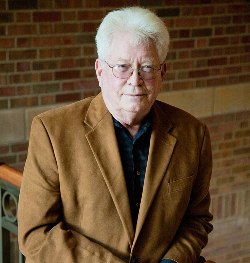 Like all of our board members, our Genealogist serves in a voluntary position and honors your requests on a time available basis. TRØNDERLAG LIST: Others will help you! Our members, and even fellow genealogists who are not members, share information on our Rootsweb mailing list doing research for you based on your posted requestst. Hundreds of individuals, including genealogists in Norway participate in this process. As with the Tronderlag list, others will help you! Stop in and visit our Facebook page. We bring our entire library of research materials to the stevne, making them available in the genealogy lab where our Genealogist and volunteers provide research assistance. 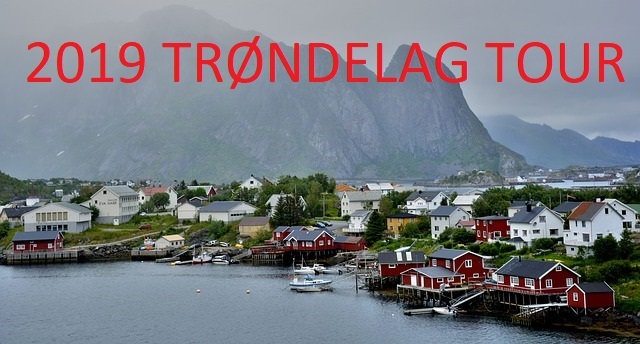 We offer a "Trøndelag Heritage Tour" about every 5 years where we travel to Trondheim, complete research at the regional archives, tour Trøndelag and neighboring areas, visit friends and relatives, and usually wish we had more time. WE ARE STARTING TO PLAN OUR 2019 TOUR. PLEASE VISIT OUR 2019 TOUR SURVEY QUESTION PAGE AND SHARE YOUR THOUGHTS ON WHAT OUR NEXT TOUR SHOULD BE. During the winter, a research trip for "Tre Lag Stevne" cooperating lags is held in Salt Lake City. This is sponsored by the Norwegian-American Bygdelagenes Fellesraad (the umbrella organization of the various lags). Attendees spend a week attending classes on Norwegian research and using all of the facilities of the LDS Genealogy Library. This is a yearly event, usually taking place in February. Recently the research trip has been combined with the annual RootsTech conference which is also held in Salt Lake city. WHAT WILL HAPPEN TO YOUR FAMILY HISTORY WHEN YOU ARE GONE? Our descendants should know what we have, where it is located and we want them to do with it. Some genealogists prepare a Genealogical Codicil. The capital of Trøndelag is Trondheim, Norway’s medieval capital, the country’s third largest city. The Gothic-style Nidaros Cathedral dominating its skyline has traditionally been the sight of the coronation of Norway’s kings, and most recently their family weddings. Trondheim was founded in 997 by Olav Tryggvason whose tall statue overlooks the city. The Nid river (Nidelven) flows through the city into the Trondheim Fjord. Trøndelag presents a wide range of scenery — mountains, valleys, lowlands, forests, streams, waterfalls, lakes, farms, cities and fishing villages. The old and the new exist side by side in Trøndelag. We sponsor recurring trips to Trondheim which includes time for research at the regional archives. For our 2014 trip, we sent research requests in advance and when we toured the archives, each person's research materials were waiting for them as we arrived. Our 2014 trip was special: 2014 was the 200th anniversary of the signing of the Norwegian constitution. We gained approval and marched in the Syttende Mai parade. We were the third unit in the "citizen's Parade". The "Children's Parade" which proceeded us had 20,000 children marching! We had a private tour of Nidaros Cathedral and a private performance on the restored Steinmeyer Organ acknowledging our financial donation to aid in the restoration Another highlight was attending a special Ecumenical service at Nidaros attended by the King & Queen, the head of Parliament and other dignitaries. During our time in Trøndelag we were interviewed by Three different newspapers, primarily because of advanced knowledge about our contribution to Nidaros. WE ARE EXCITED ABOUT OUR NEXT TOUR! TEN PEOPLE HAVE ALREADY MADE THEIR DEPOSIT! WE HAVE A PRICE ($3,490 pp, $690 SINGLE SUPPLEMENT). A SEPARATE ENGLISH LANGUAGE TOUR WEBSITE WITH ALL THE DETAILS IS NOW AVAILABLE. SCANDINAVIAN BREAKFAST, 11 DINNERS/EVENING MEALS, 5 LUNCHES, TRAIN TICKET FROM OSLO AIRPORT DOWNTOWN, TRAIN TICKET FROM OSLO TO TRONDHEIM, BUS TRANSPORTATION, TOURS, OSLO PASS, SPECIAL VENUES, AND MORE, THOSE WHO HAVE TRAVELED TO SCANDINAVIA BEFORE WILL RECOGNIZE THIS CUSTOM TOUR AS A GREAT VALUE AND NOT JUST YOUR PLAIN OLD PACKAGED TOUR! Hedemarken) JOIN TOGETHER TO HOLD THIS ANNUAL MEETING. Many years ago each lag (organization) held their own stevne before they discovered they could share in overall costs, invite a broader range of speakers, attract quality vendors, etc. Also because of their proximity many attendees have ancestors associated with more than one lag (sometimes all 3, OR MORE)! Are you willing to volunteer some time and talent at the Stevne? We can use some help with a variety of tasks at the Stevne: spend an hour or two assisting in the Hospitality Room, take photos of Stevne activities, work at the Trønderlag membership table and perhaps things we haven't thought of yet. Please contact any of our offices, for more information about our needs. Want to know more about the 2018 stevne?. You will get one in your registration package, but you can check it out now. Click/Tap on the image. Register for the stevne. Large numbers also go on the Wednesday tour so it pays to register early. Also register for the Friday Banquet. Click/Tap on the image for a registration form to print. You can fill it in before you print it and it will calculate the correct fees, etc. (SOME BROWSERS DO NOT SUPPORT AUTO CALCULATION). for a booklet to print. Group rate of $99 not available when using on-line reservation. Call the hotel directly to make your reservation, specifically asking for the Tre Lag Stevne group rate. We are currently negotiating the availability of a breakfast buffet. Hospitality Room: We have hot coffee, Norwegian and other treats to enjoy on your breaks. We encourage you to bring desserts that can be eaten in individual pieces to contribute to the room. Also we always need volunteers to keep the serving area full of goodies, make coffee and help keep the room pleasant for all to enjoy. The stevne starts Wednesday about noon and ends Saturday about noon and features a local history tour, a concert, 16-18 programs, lag annual business meetings, group lag photos, and a Friday night banquet. 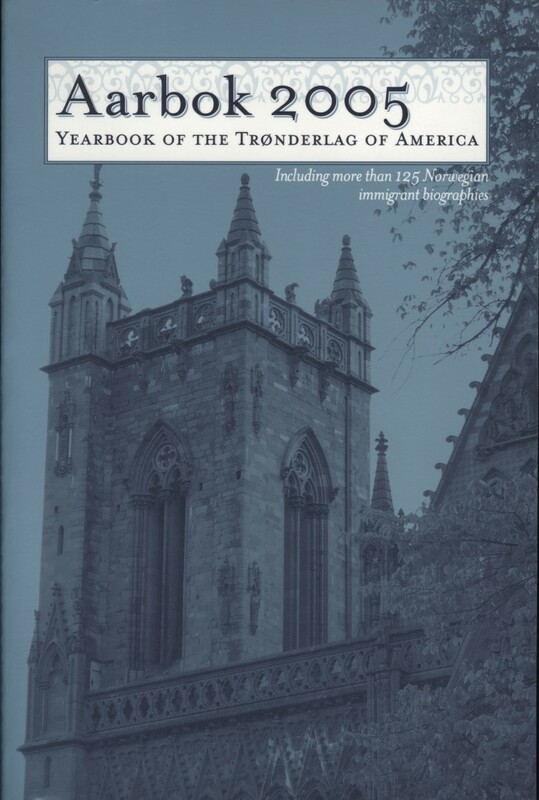 ÅRBØKER: In 2005 Trønderlag of America re-established the tradition of publishing a Trønderlag Aarbok (a yearbook). This 2005 Aarbok was the first the lag had published in more than 20 years. 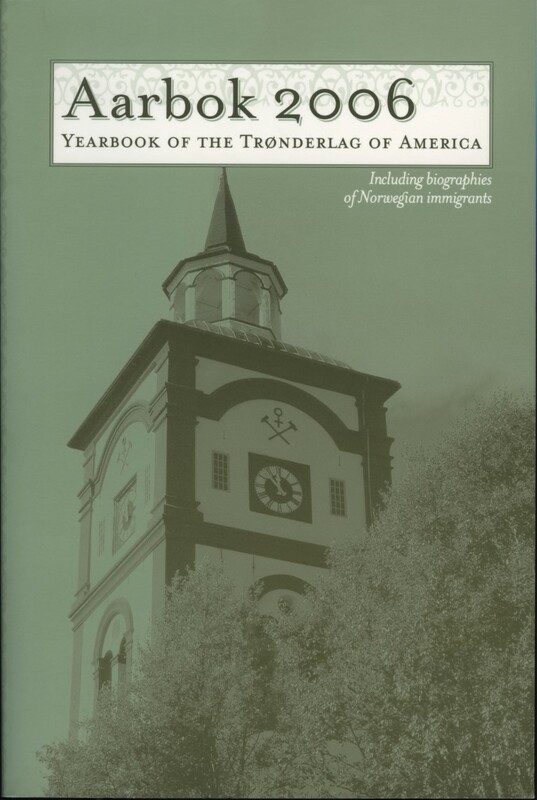 The purpose of the yearbook is to help us maintain a history of Trønderlag and share that history with lag members and others. Our special focus was immigrant biographies and we were highly successful in having a large number submitted for the book. Some biographies included several generations of families. Many included photos. 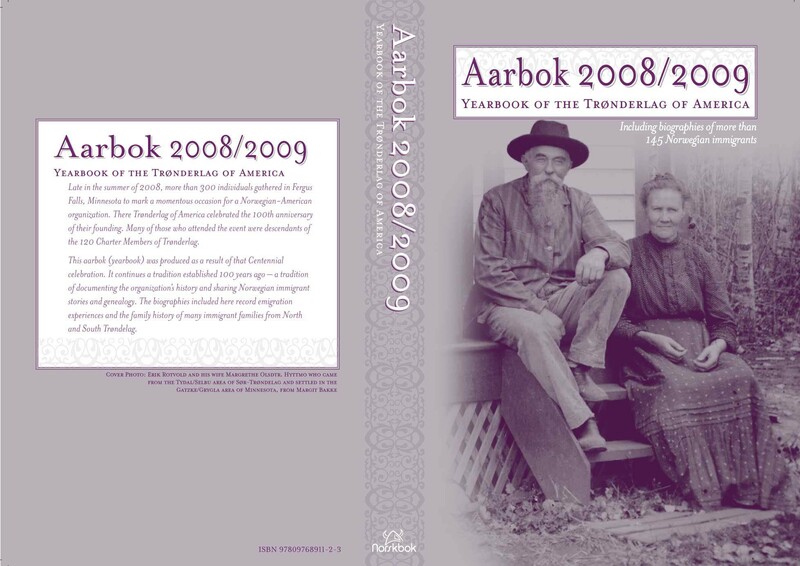 The Lag published another Aarbok in 2006, a Centennial book in 2008, and a third Aarbok in 2008/2009 and a fourth Aarbok in 2012. There are copies of all aarboks available from the lag at stevne or by mail. ÅRBØKER DONATIONS: In 2017 our Board voted to donate årbøker to genealogy/family history organizations. TRØNDERLAG NYHETER BREV: A 12-16 page newsletter, "Trønderlag Nyheter Brev", is published three times a year. Members receive the newsletter as part of their membership dues. It contains information about the activities of the Trønderlag and its stevnes as well as genealogical and cultural articles. There are interesting articles about its members in America and Norway and countless other topics relating to Trøndelag heritage. Article contributions related to Trøndelag, your immigrant families, or other Trøndelag or Norway related topics are always welcome. Send them to the newsletter editor. You can request a sample newsletter. 2005: Includes Lag history and photos, emigration stories and letters, and 125 Trøndelag immigrant biographies. Fully indexed. 424 pages. ISBN: 0976891107. 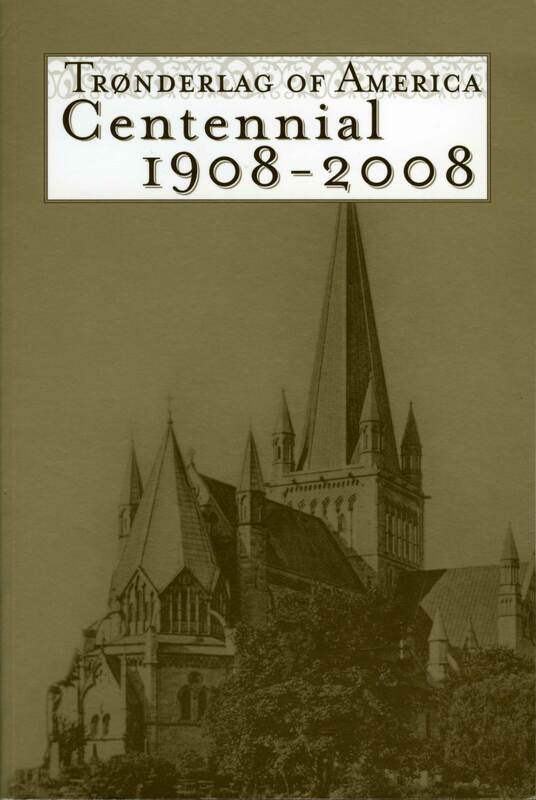 CENTENNIAL - 1908-2008: Written in commemoration of the 100th anniversary of the Trønderlag of America, this book includes the Centennial program, organization history, short biographies and pictures of the 120 Charter Members along with a list of "found" descendants of these Charter Members. 144 pages. ISBN: 0976891131. 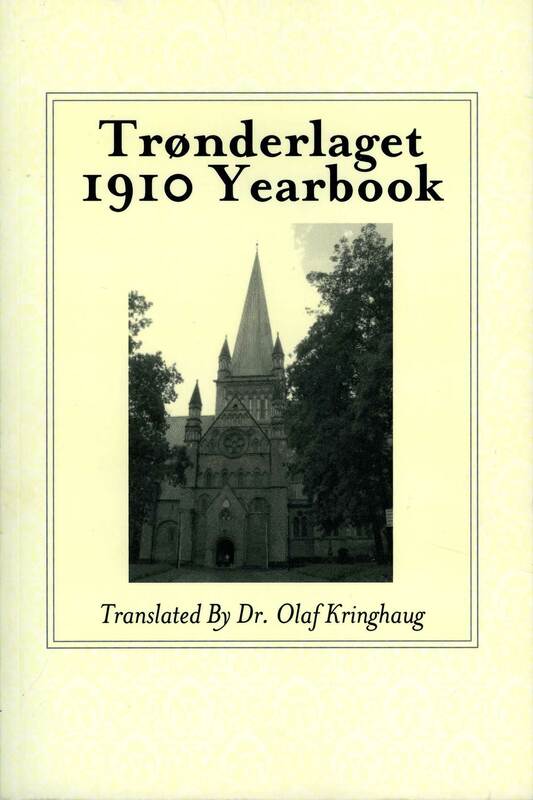 1910 Yearbook (Translated): This is a translated version of the very first Trønderlag aarbok. It includes a full membership list, reports from the stevne in Glenwood in 1909 and Grand Forks in 1910, the original Constitution and Bylaws. An Index has been added. 56 pages. Available at Stevne and by mail. ISBN: 097689114x. Board members are all volunteers and contribute their personal time to help fulfill Trønderlag of America's goals. Board members serve for 2 years. Three of Trudy's grandparents were of Norwegian descent. Trudy attended her first Tre lag stevne in 2005 where she was impressed with the sheer amount of available information, seminars and helpful friendly people. Traveling to Oppland & Buskerud in 2002 and on our Trønderlag of America Heritage tours in 2010 and 2014, she represented us at our 2014 presentation of a donation to Nidaros Cathedral in Trondheim. An amateur genealogist since 2001, 100 % of Jon's Norwegian heritage is from Nord Trøndelag (Skatval & Hegra). He has traveled to Norway multiple times and visited the locations of each farm associated with his family. 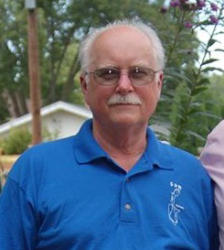 He created our 2014 Trønderlag of America Heritage Tour and maintains our web site. Linda's Norwegian ancestry was concentrated in Sør-Trøndelag (from Horg to Støren / Singsaas to Budal and Soknedal). Her great-grandparents emigrated in 1880 and 1883 and came from Skaarvold and Rognes farms. 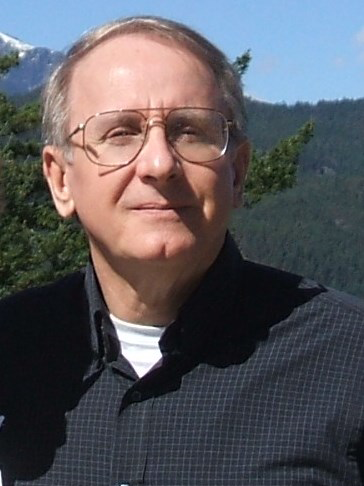 Barry joined Tronderlag in 1991, serving as Assistant Genealogist from 1994-1997 taking over as our lag Genealogist from James Pedersen in 1997. 3/4ths Tronder, with roots in Leksvik, Selbu and Stod in the Steinkjer area he lives in Rochester, MN, and maintains the Tronderlag Library at his home. Joy Haugan Williams + 2 open positions. 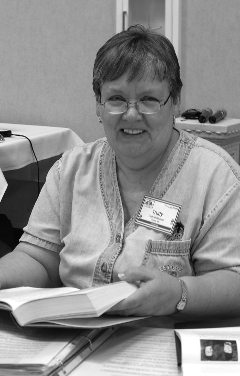 Genealogy & Social Media: Margit Bakke. From "Trønderlaget of America 1908-1984" . . In March of 1904 a group of Tronders got together to plan a Trønderlaget stevne, but abandoned the idea because of bickering over what territory in Norway they should include. They were afraid they would cut a poor figure in comparison with the Valders group. A Trønderlag was hastily created in June of 1907 but received little support and failed. The Trønderlaget of America was finally organized on September 17, 1908 at Fergus Falls, MN. Before the organization, there had been much writing and correspondence in the Norwegian papers, "Scandinavian" and "Decorah Posten". They had a difficult time finding someone to take the leadership. Faculty members of Tronder background at Park Region College in Fergus Falls, headed by the president Rev. D.G. Ristad, were among the promoters. Prof. Thomas Wollan and Prof. I. Darrum on their own called an organizational meeting. All Tronders from the eight fylkes were to be included. Later there were 15 more stevnes organized. Prof. Wollan, a banker and businessman from Glenwood, was the first president. Other officers included D.G.Ristad, John Wist, Thomas Warloe, O.C. Hauan, A.C. Floen and Lars Hayseth. There were 120 charter members but before the next stevne, more than 400 joined. In 1925 the membership had grown to 2,556 to become one of the largest stevnes. The Tronderlaget early published yearbooks and were early members of Nordmans-Forbundet. They also helped organize Bygdelagens Fellesraad. Money to help build a Kors Altar (choir altar) was donated to Trondheims Domkirke and they also presented an expensive model of Nidaros Kirke to the Norwegian-American Museum at Decorah, Iowa. In 1926 the Tronderlaget in Duluth was unkindly characterized as an "old folks coffee party," because it did not attract the younger generations of Tronders. A magazine called the "Trønder American" was published from 1935-39. In 1936 a gathering of all the separate stevnes was held at Madison, MN with a good attendance. During World War II, no Tronderlaget stevnes were held. When the Tronderlaget met in 1966, it was decided that because of the discouraging low attendance at the stevne, it had served its purpose and thus was disbanded. Henry Nycklemoe of Fergus Falls was president at that time. The lag was brought back to life in 1982 in Dawson, Minnesota. The group responsible for that stevne included Agnes Boraas, Floyd and Selma Boraas, Irvin and Anna Kleven, Lowell and Bernice Oellien, Rudy and Bernice Prestholdt, Bervin and Arlene Skjei, Mildred Skurdahl, Ellsworth and Sylvia Smogard, Orvin and Josephine Larson, Selma Torstenson and Berdeen and Mable Vaala. They raised money by selling bumper stickers, pins, and other items and holding a raffle. They only charged $1.50 for a membership "so that no true-blooded Tronder would feel they couldn't afford to belong." At the business meeting, the following were elected to the Executive Board: Co-chairmen Bernice Oellien and Mable Vaala; Secretary Orvin Larson, Treasurer Ellsworth Smogard, Historian Meredith Ulstad; Directors Curtis Olson, Esther Opien and Ilene Chapman. In 1999 the lag was renamed "Trønderlag of America" and a new set of by-laws were ratified by members at the business meeting. Tronderlaget Tordenskjold; organized in Seattle, WA before 1925. NORWAY HOUSE THANKS TRØNDERLAG OF AMERICA FOR DONATION. We just made another $500 donation to Norway House taking our total to $1,100 (and with matching grants, effectively $2,100). Pinterest and Twitter not currently active - Visit our Facebook page.